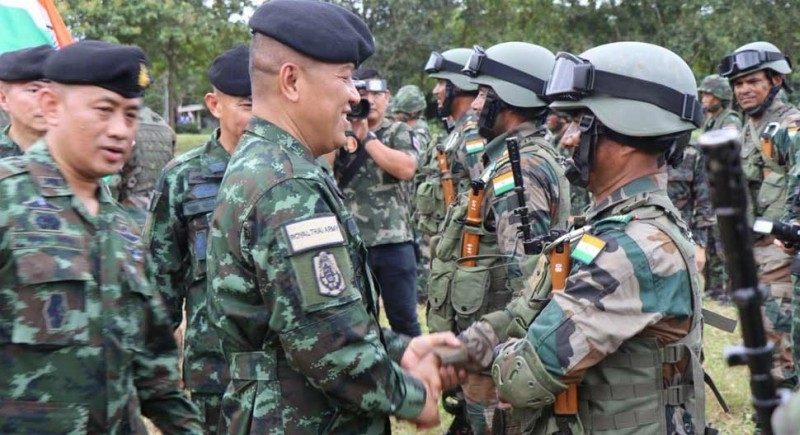 New Delhi, August 20: Strengthening bilateral ties and friendship between the armed forces of India and Thailand, the Indian and Thai armed forces on Sunday concluded a two-week long platoon level military exercise called 'Exercise Maitree 2018' in Jammu & Kashmir's Srinagar. The exercise was an annual event designed to strengthen the partnership between armies of the two countries. The first phase of the training also focused on familiarizing both armies with each other's modus operandi, basic maneuvers, and evolving joint drills in the first phase. The second phase consisted of training related to various drills and tactical scenarios in a counter-insurgency environment, execution of tactical operations like search and destroys operation, house intervention, and survival techniques. The exercise began on August 6 and comprised of cross-training period, which included familiarization between the two armies to evolve drills and procedures that help in counter-insurgency and counter-terrorism operations in varied terrains under the United Nations (UN) mandate. The exercise concluded with a 72-hour joint session on a series of tactical operations like raid, pursuit, establishing military check posts, and cordon and search operations. The exercise saw both the armed forces immensely benefitted from each other's expertise and experience, thus helping in the enhancement of cooperation and bonhomie between the troops.